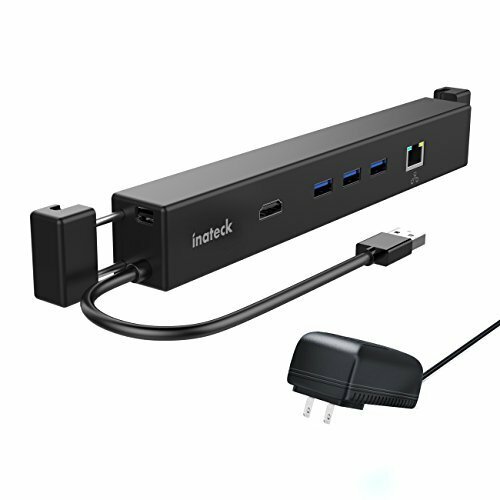 Inateck HB9002 features multiple ports, including 1*HDMI 1.4 interface, 1*Gigabit Ethernet, 3*USB 3.0 A and 1*5V DC port. They extend your surface greatly, make your work more efficient, and bring you convenience. With Inateck HB9002 you may easily convert Mini DP to HDMI 1.4(the Mini DP to Mini DP cable was included), and then display content on large screen via the connection of a HDMI cable. HDMI output supports 1080p and 4K x 2K @30Hz 24 bit color output and supports 8-channel sound output. Equipped with a RJ45 Gigabit Ethernet interface, which conforms to IEEE 802.3 standard and self-adapts to 10/100/100Mbps network transmission. Office users can enjoy more stable Ethernet through cable connection. Three USB Type A ports provide users with more choices when connecting external devices. The DC adapter can power devices connected and supply sufficient power to the high-power device connected. Compatible devices: Surface Pro 4, Surface Pro 3, Surface 3, the new surface pro and other USB-A laptops. Perfect for Microsoft Surface: An elastic and stretchy design makes the docking station match perfectly to the Microsoft Surface. It’s attractive, as well as convenient. Multiple Ports: 1*HDMI 1.4 interface, 1* Gigabit Ethernet, 3*USB 3.0 A and 1*5V DC port. These ports make your work more efficient, and also bring you more joys in entertainment. Mini DP to HDMI Port: Makes it possible to display content on large screens and carry out work on multiple desktops. HDMI output supports 1080p and 4K x 2K @30Hz 24 bit color output; 8-channel sound output is supported. Equipped with DC: Comes with a DC power adapter (5V/2A, DC 3.5*1.35mm, L=1.5m). It can supply power to high-power downstream devices. Premium Material: ABS material with size of 256.6x32x25.7 mm makes the docking station lightweight and easy to carry. Will not scratch computer because of silicone pads on the contact surface.